To Stream or Not to Stream… Soda that is! Did you have fun celebrating Earth Day last week? This day provides a great opportunity for us to consider our daily activities and how we can adjust them to sustain our environment. How did you celebrate? Did you make any big lifestyle changes hoping to make a lasting impact on our planet? Chris Jackson, President of NCES, purchased a SodaStream machine for the whole office to use. So, we’re here today to tell you what we love, and don’t love, about the SodaStream. First, what is a SodaStream? It is a machine that uses tap water and converts it in to soda, sparkling waters and sparkling teas. Currently, SodaStream offers over 25 different flavors. With just a couple tablespoons of your favorite flavor concentrate, 1 liter of tap water and the SodaStream carbonator, you can make your very own carbonated beverages at home. The biggest advantage to using a system like this is the inherent benefit to the planet. Did you know that the US is the world’s largest consumer of bottled water? This bottled water habit we have been sucked in to is bad for us and for the environment. Why? Because, according to the US Recycling Institute, only about 20% of bottles used in America are actually recycled. The other 80% end up in landfills across the country. SodaStream is also an ActiveGreen product. This means that users are actively reducing their carbon footprint each time they use their SodaStream. Many products are made using ‘green’ processes. However, these products are not designed to help the user be ‘green’ each time they use the product. The SodaStream is! So, you can rest better knowing that each time you use your new SodaStream machine, you reduce your carbon footprint. The only downfall we found to this product is the initial cost. SodaStream has quite a few options for consumers to choose from. 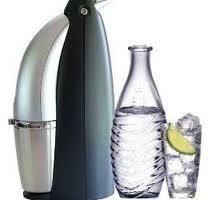 These products range from $79.95 to $199.95, offering carbonators with either plastic or glass bottles. But, after you make the initial investment, you will be paying only 25cents per ‘can’ of soda that you make. Or, 25cents per liter of sparkling water. This is a pretty big savings from what you would pay in the store for soda or sparkling water. So, if you’re willing to make the initial investment, we think that the SodaStream machine provides a great, cost-effective opportunity to reduce your daily carbon footprint. We should also mention that, while the SodaStream is great to have, a big glass of ice water is still the best way to refresh and replenish your body. You should still strive to consume your daily recommendation of 8-16 cups of water per day. However, if you are good at meeting your daily water recommendation and enjoy a soda here and there, getting yourself a SodaStream to save money and preserve the environment may be a good choice. Do you already have a SodaStream? What do you think are the pros and cons? Did you decide to go get one after reading this article? If so, share with us what you think of your new SodaStream! Tomorrow, April 22nd, is Earth Day and all of us here at NCES are very excited. In order for us to be healthy, our planet has to be healthy. Earth Day is a great opportunity to begin celebrating Mother Earth and brainstorming ways to keep her healthy. Have you jumped on board yet? Here are 6 ways that many Americans have started ‘Thinking Green’ to conserve our planet (Courtesy Readers Digest). Green Driving: Roughly 1.5 million hybrid cars were sold in the US between 2004 and 2009. Most of us drive our vehicles on a daily basis. So, this is a great place to start. Turn off the Lights: 1 in 2.17 adults claim they always keep unneeded lights off or turn the lights off when leaving a room. Not only does turning off the unused lights help save the planet, it will also have a direct impact on your electric bill. Recycle, Reduce, Reuse: 1 in 2.38 adults claim they always recycle. But, 1 in 20 admit they never recycle. According to the Environmental Protection Agency, recycling creates jobs, reduces pollution, energy use, and conserves national resources. Many cities are currently offering new programs to encourage residents to recycle. Check with your city to see what you can do today. Trash Can: The average American produces 1,600 pounds of garbage a year. 1 in 3.7 adults claim they always reuse things instead of throwing them away or buying new items. But, 1 in 25 admit to never reusing things. Garbage is sitting in landfills all across this country. By reducing our personal trash, we can reduce the size of these landfills. Running Water: 1 in 3.85 adults claim they always make an effort to use less water. However, 1 in 16.67 admit they never make an effort to conserve water. The average American uses between 80 and 100 gallons of water a day. You may be asking; if water is constantly recycled through Earth’s water cycle, why do we need to conserve it? The truth is that we currently use water faster than it can be replenished. So, conserving water eases the burden on treatment facilities, uses less resources and energy and costs us less. Vampire Power: 1 in 6.25 adults claim they always make an effort to unplug electrical appliances when not using them. However, 1 in 6.67admit they never make such an effort. The electricity used by appliances plugged in but not in use is estimated to account for 1% of global C02 emissions. Where do you start? Begin by unplugging the items around your house that you don’t use often. For example, you may only use your toaster once every couple weeks. Therefore, it doesn’t need to be plugged in 24/7. This is also a good rule of thumb for your home printer, if you don’t use it often. Buying local food items, including fruits, vegetables and meat. Using natural food products in your recipes. Plant your own garden, any size is great. There are many great resources available to help you begin ‘Living Green’. For a full list of NCES products to get you started visit our ‘Green Products’ section. Also, check out this Earth Day video created to encourage everyone to begin considering our planet when making decisions. Have you ever celebrated “Grilled Cheese Sandwich Day”? Well, we haven’t! So, we are pretty excited to be celebrating, for the first time, with you today! Grilled Cheese sandwiches are one of the most versatile foods around. So, we couldn’t think of a better way to celebrate with you than by giving a few examples of ways to ‘spice up’ your grilled cheese, and make it a nutritious, filling option for you and you’re family! Many people enjoy eating their grilled cheese sandwich with a large bowl of tomato soup. However, tomato soup is high in calories. So, our first change is simple, but tasty. Simply adding your favorite veggies, like tomato slices, to your grilled cheese sandwich is a great way to add nutrients and flavor. Not only are you going to get rid of unnecessary calories by subbing soup with vegetables, they are also packed with many health-promoting vitamins. Another one of our favorite vegetable additions are red peppers and onions. Another way to cut calories, and liven up the flavor of your grilled cheese sandwich, is to switch up the type of cheese that you use. Traditionally, grilled cheese sandwiches are made with sliced American cheese or Velveeta. These cheeses are high in calories and not as full of flavor as some other options. Next time, try switching those old, boring cheeses, for a half slice of low-fat cheddar and a half slice of low-fat Swiss. This combination will give your sandwich a great new flavor, while cutting your total calorie intake. Are you tired of eating your grilled cheese sandwich on plain, white bread? So are we! Switching out your boring old bread for a tastier option can also be healthy. Be sure to use a whole-grain replacement. You can also use new sandwich thins. Or, to really change things up, try making yourself a grilled cheese rollup, using tortillas. In the past, you may have though of a grilled cheese sandwich as the last option, when you didn’t feel like cooking anything else. Now, with these simple changes, you can look at a grilled cheese sandwich as a nutritious, gourmet dish that your whole family will enjoy! 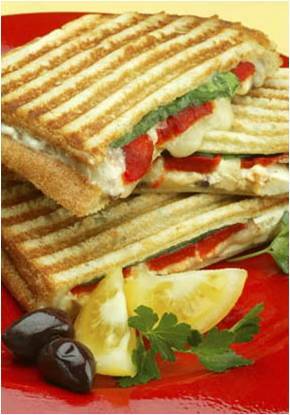 How do you like to make your grilled cheese sandwich both healthy and tasty? Share your comments by posting a comment on the blog, on Facebook or on Twitter. Earth Day is April 22nd. So, we’re starting the celebration now! Connect with us to join the celebration.